They will manipulate you. They will try to make you into what they think you ought to be, rather than what God made you to be. “When Jesus spoke again to the people, he said, ‘I am the light of the world. Whoever follows me will never walk in darkness, but will have the light of life” (John 8:12 NIV). When Jesus said, “I am the light of the world,” he was defining himself. He was saying, “I know who I am.” At least 18 times in the Bible, Jesus said, “I am” and then gave a description. He described himself as the door, the bread of life, the way, the truth, the resurrection, and the life. Over and over, he defined himself. Jesus knew who he was (and still is), and as a result, he was not under pressure. This is the principle of identity. As long as you are unsure of your identity, you’re going to be pressured to fit into other people’s molds. They will manipulate you. They will try to make you into what they think you ought to be, rather than what God made you to be. One of the major causes of stress comes from trying to be somebody you’re not. When you are fearful that someone’s going to find out what you’re really like and that you might not be able to keep up the façade, it causes stress. The only way you can counterbalance outside external pressures is to have an internal sense of satisfaction about who you are and who God made you to be. You discover who you are by knowing whose you are. The Bible says that you were created by God. You are deeply loved by him. You are accepted as you are. He has a plan for your life. Until you settle this issue of identity, you will be insecure and you will be pressured by stress. You cannot serve other people until you settle this issue. Jesus constantly did things that surprised everybody else. He put himself below others and served them. None of the disciples would have ever thought to wash each other’s feet in the Upper Room because of their insecurity. But Jesus always served from a position of strength. He knew who and whose he was, so it didn’t matter that he lowered himself to serve them. Service comes from self-esteem. Until you overcome your insecurity and feel good about yourself, you won’t feel like helping anyone else. Be secure in who you are and whose you are so that you can effectively serve others. What are the differences between what the world and others say about you and what you believe God says about you? What does it mean to serve from a position of strength? 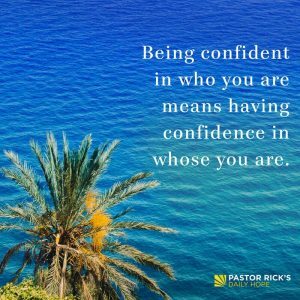 Why do we serve more effectively when we are secure in our identity in Christ?